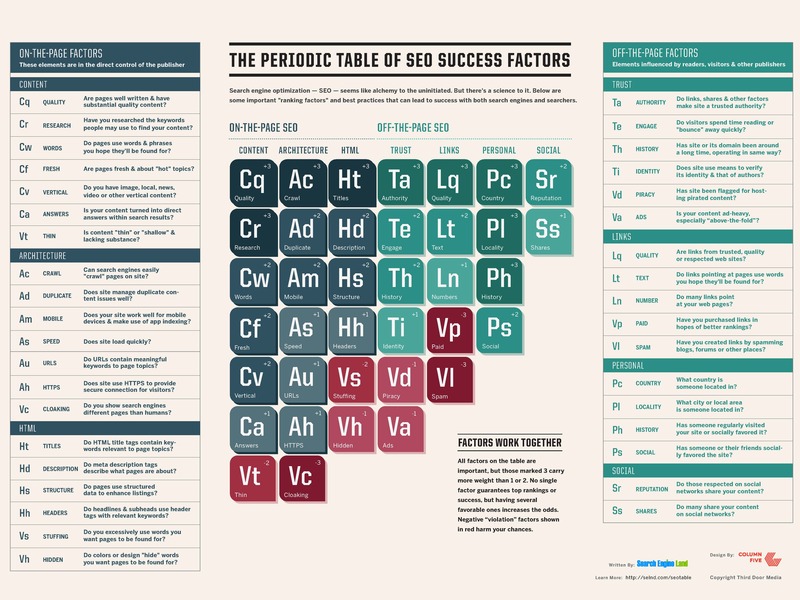 The Periodic Table of SEO Success Factors for 2015 was released at SMX Advanced this month. Search engines consider hundreds of factors for search, thankfully this table highlights the most important factors for ranking high in search results. The above factor requires a website or web pages within the website to have images, local, news, videos or other vertical content. This factor focuses on driving additional traffic to the website from vertical results such as images from the website pulled on the one box on Google. 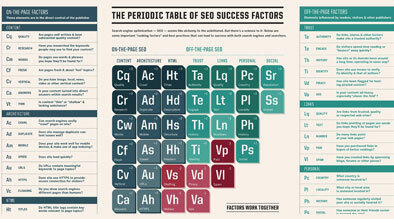 This factor targets whether the content on the website is turned into direct answers with search results or not. This factor is very new to the industry as well as for Google itself, and is on trend with more searchers asking questions to their device rather than typing statements into the search bar. To ensure your site is in the direct answers consistently and driving traffic requires constant monitoring and optimization. Check Google Analytics to measure the engagement, bounce rate, and the next pages that people are visiting before ending their session- all indicators of relevancy. Checking Google Search Console will ensure there are not any errors reported by Google on the direct answer page, and lets you set priority pages for Google to index more frequently. Now this factor is a little tricky as Google is emphasizing the importance of switching from http to https because of security and a good user experience, but current research hasn’t found a direct or strong correlation between switching to HTTPS and higher ranking. We recommend having your site on HTTPS if you have a shopping cart or carry out any other kind of transaction by the end user. This will build trust as well as provide a secure connection to your visitors. Search engines are judging whether your visitors spend time reading the content or bounce away quickly. Search engines are evaluating this off page factor through social gestures such as comments, shares of your website, images or videos and “likes” on your social profiles. Getting likes and comments on social profiles might be easier versus having people share the content, images and videos from your website. – Constantly refresh the content on your website, specifically on pages that need fresh content. Ex: local event pages, special offers pages, news or blog pages on the website. For the Ads factor, it is important to have content that is ad free, both on and off page. Example of off page ad heavy content can be your business listing on a wedding site that has ads above the fold. It is critical to maintain and regularly enhance your on-page and off-page listings and mentions. Important Note: Both of the above factors were on the 2014 periodic table under On The Page SEO factors, this year under Off The Page in Trust. Both on and off page engagements have been becoming important for the search engines and only paying attention to one of these is doing a disservice to your business. If you are interested in learning more about 2015 search factors or how Milestone drives revenue to our hospitality clients please call (408) 492-9055.